Why not introduce a splash of colour in your bathroom to add a touch of drama and character. Whether it's a statement piece of furniture, bold mosaics or brightly coloured accessories the choice is yours and the options are endless! Here are some of our top tips on adding colour to your bathroom suite. ​Who says your bathroom walls need to be neutral? A simple way to give your suite a face lift is by simply painting your non-tiled walls in a bold, eye-catching colour. Why not be brave and pick something dramatic such as PANTONE 16-1546 Living Coral -Colour of the Year 2019. This colour embraces us with warmth and nourishment found in natural coral reefs beneath the sea. 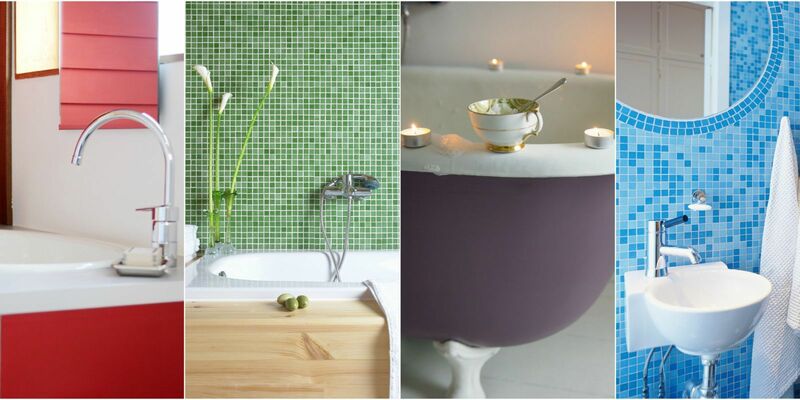 ​If you just want a statement piece in your bathroom, why not opt for a coloured bath. Aston and Bentley offer a range of colours to give you a big WOW in your bathrooms. Be brave and paint your classic bath a bright shade of pink or yellow! Cabinets, shelving and vanity units can be the perfect place to add some colour. Installation cabinets with brightly coloured exteriors will create an eye-catching focal point and add a dramatic colour scheme. Villeroy and Boch have a stunning range called Finion which allows you to mix and match different colours to make your vanity unit unique to your bathroom. ​Mosaics and tiles are one of the best ways to make a bathroom feel unique and individual. Tile one wall behind a bath, inside a shower enclosure or behind a basin for some drama without giving yourself a headache. Accessories are one of the easiest and most cost-effective ways to bring some colour and life back into a dated or neutral bathroom. Towels, candles, bottles and flowers are only small but can make a big impact. Many customers are breaking away from traditional white or chrome towel radiators and choosing coloured versions instead, they also have the added advantage of being approximately 25% more efficient at transferring heat than chrome ones. Zehnder, Bisque and Radox offer a range of colours to suit you and your new bathroom. For more information about these products and ideas please come and visit us in the showroom.